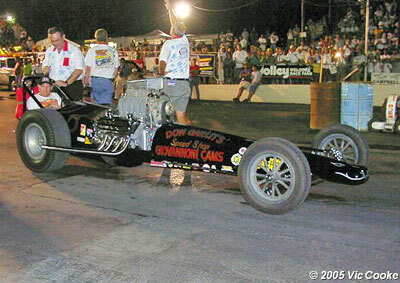 The Swamp Rat was originally built in 1957 by Don Garlits and competed for the first two years unblown, with 6, then 8 carburetors modified for running nitromethane and benzene. 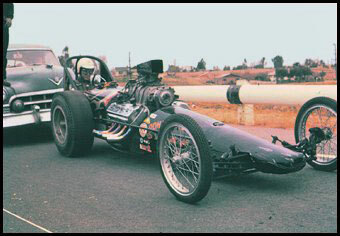 At first, the car had a two-speed transmission and a full width rear end, and ran a best of 10.5 seconds and 145 mph. 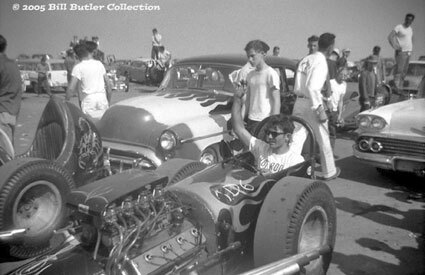 At the ATAA World Series of Drag Racing at Cordova, IL., in August 1957 Don met Emory Cook and Cliff Bedwell and Emory gave Don some ideas on how to improve performance and assisted him in getting his tune-up closer to what he needed to run competitively on Nitro. 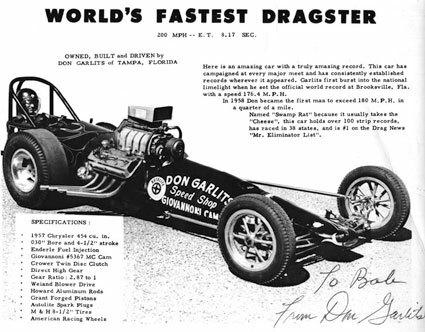 Don ran a career best of 155 mph at 9.60 seconds, beating Cook and Bedwell, going to the finals where he lost to Serop "Setto" Postoian. Returning home Don revamped the car, lowered the front end and the engine location, took the transmission out and installed a narrowed Oldsmobile rear end. Don then built a pair of wire spoke front wheels and a new nosepiece. 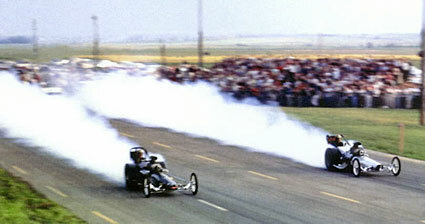 Then on November 10th, 1957 he sat the drag racing world on it's ear when he ran 176.40 mph in 8.79 seconds. Both marks were a world record. Through 1959 Don toured with the car basically unchanged from when he set the records in November 1957 and attended races from one coast to the other. 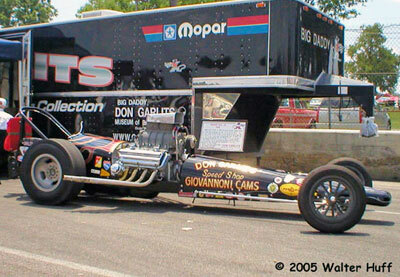 Here the Don's Speed Shop Special pictured behind Isky's shop with Setto Postoian's car behind. 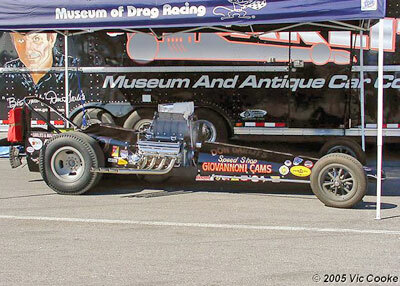 This was the week before the first Smokers March Meet at Bakersfield. This was also the last week that the motor cover would fit on the car. 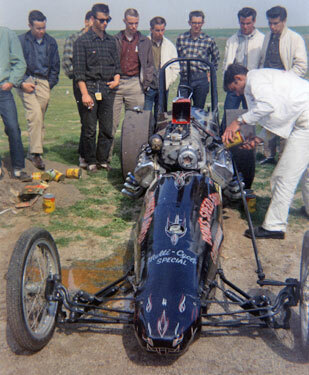 After the March Meet where Don wasn't able to equal the performance of the supercharged Nitro burners he installed a blower and was loaded for Bear at Kingdon Dragstrip, where he cleaned up on the field. 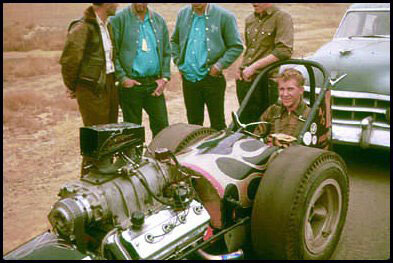 Here are two very rare shots of Don at Kindon, CA in 1959. On his way back to Florida from California, Garlits stopped off at Chandler AFB and had some fun with the Arizona boys and a few Californians. 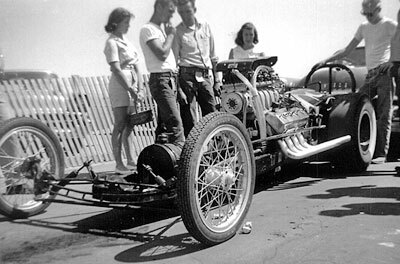 Here you can see that Don simply slipped a blower under his eight-carburetor set-up. 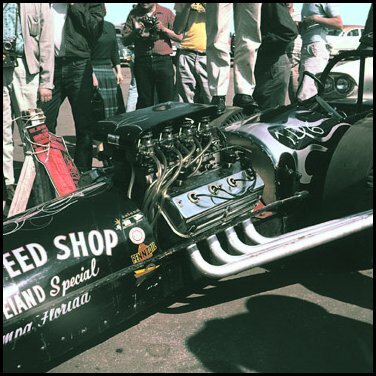 They worked okay and Don was one of the last to stick with them, but they were not as precise in fuel metering as the more commonly used Hilborn fuel injection. Also, the numerous fuel delivery and overflow return lines that were necessary with the Stromberg carburetors was daunting to say the least. 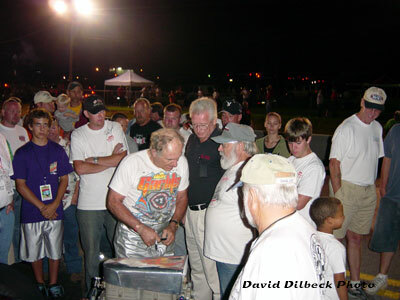 After incurring burns at a race at Chester, SC. 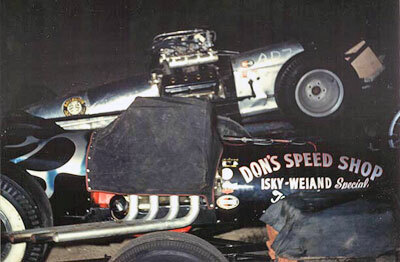 in 1959 Don was unable to drive and his friend Art Malone, pictured here with Don, took over the driving. 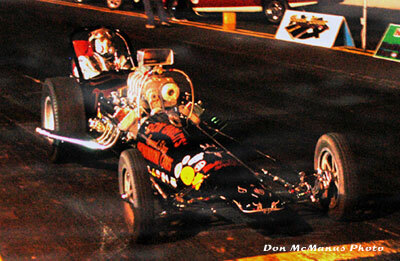 Don also changed over from the 8 carburetor set-up he had used previously, to a Hilborn two-port injector. With the ability to tune the car more accurately performance immediately improved. At one of the first outings with Malone in the seat at Sanford, ME. 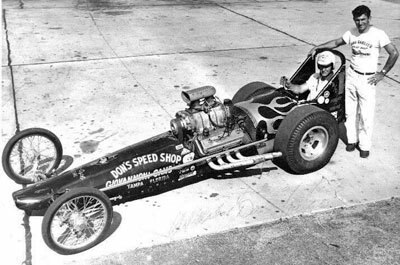 on August 23, 1959, the car set a new Standard 1320 speed record of 183.66 MPH. In September Art and Don attended the AHRA Nationals in Great Bend, KS where they set a Standard 1320 ET record of 8:23 which would last for some time. In spite of the record setting performance they were defeated for the first time by an upstart team from Chicago, Chris Karamesines and Don Maynard with "The Chizler". 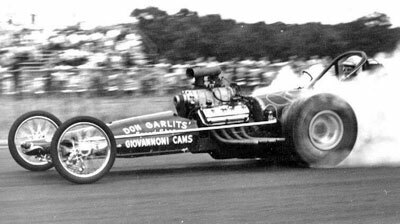 This was the beginning of an enduring competition between "The Chizler" and The Swamp Rat" and a continuing friendship between Garlits and Karamesines. 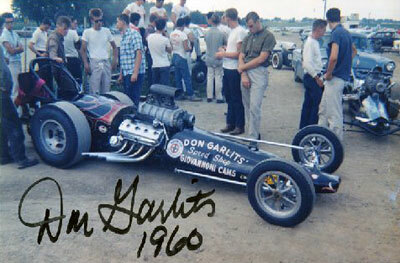 The Garlits/Malone partnership itself lasted something under a year, but in that time they established themselves as the most feared car in competition and set numerous track records and multiple National speed or elapsed time records. 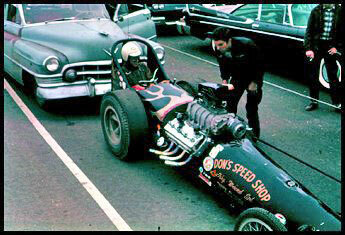 Here are three shots of Don and Art at Riverside Raceway in 1959 for one of the major events held there. Don and Art traveled steadily, going from Coast to Coast to find the "money" meets! 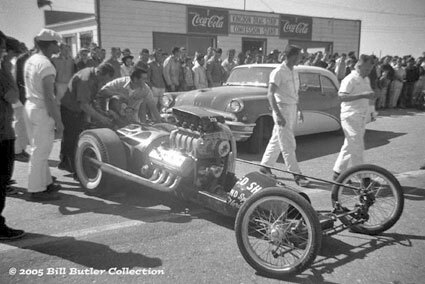 Back on the West Coast at Riverside Raceway in December 1959, Art and Don won the event beating Art Chrisman in Hustler 1 in the final. Don and Art had top time and low e.t. at 181.81 MPH in 8.51 seconds. 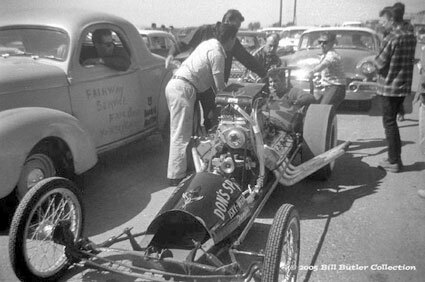 Don returned to Bakersfield for the March Meet again in 1960, with Art driving. As was commonplace for Art and Don, they ran top speed of the meet. In doing so, they also set a new Standard 1320 record of 185.56 mph, beating their own Standard 1320 record held since August of 1959 of 183.66 mph set at Sanford, Maine. 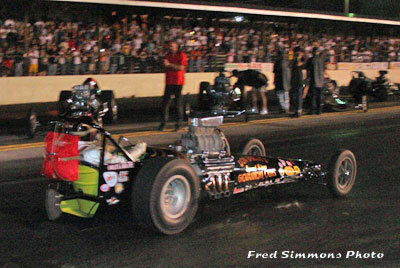 The following week at Fremont, they were the stars beating Ted "Curly" Cyr with a 8:42 e.t. at 184.04 mph for Top Eliminator. 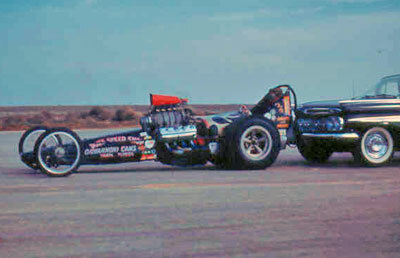 They also reeled off a series of runs, which culminated in another new Standard 1320 speed record of 187.10. It seemed like there was a picture of the car in Drag News every week. Memorial Day weekend 1960 Don and Art attended the annual holiday weekend event at Union Grove, where Bob Metzler brought together all the hot cars he could assemble. The rivalry between Garlits/Malone and Karamesines/Maynard continued with Garlits/Malone looking for revenge for the Great Bend KS defeat by the "Chizler". 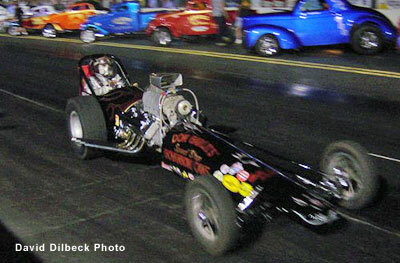 Here is a classic shot of what it was like back then when the "top dogs" ran! Art Malone edged out Karamesines on this day, racing him twice. Once for class and then again for Top Eliminator, as was the practice in those days. The "Swamp Rat" took home the Cheese. This picture was taken by Norbe Locke at the Memorial Day event at Union Grove. What's special about it is that Ron Johnson, publisher of the www.cacklefest.com site is standing with his back to the camera at the far left. Don and Art toured the car extensively from late 1959 through July 1960. They raced full competition shows and match raced as often as they could. 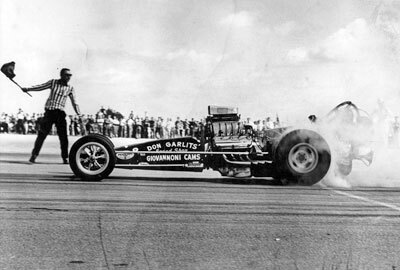 Here's Art Malone in 1960 on a mission at Minnesota Dragway. 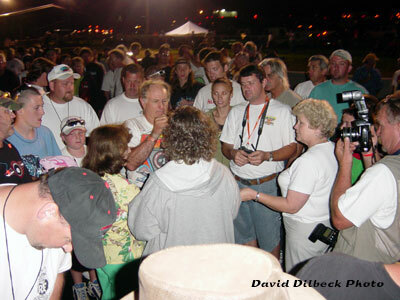 Art and Don separated on July 17th after the race that this picture was taken at. 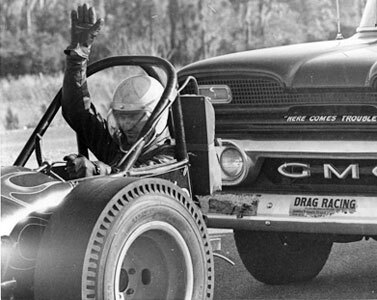 Don returned home and modified the roll cage to better fit him, and began to drive himself. Here Don signals the driver of the famous Black and White Carryall that he's ready to go. 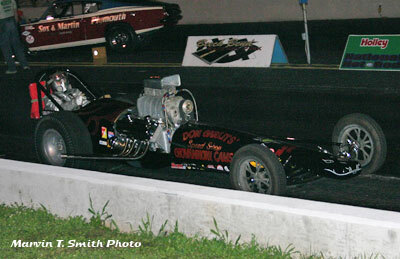 This picture was taken at the Golden Triangle Drag Strip. Sidebar about the Carryall. In early 1960 Smoky Yunick, who was a friend of Don's, was visiting one day and was dismayed that Don was using a passenger car for a tow vehicle. A few days later, Don got a call from a local Chevrolet dealer that there was a 59 Chev Carryall there and he was supposed to come and get it, compliments of Smoky. It was a former Sheriffs Department vehicle, hence the Black and White color scheme. Don never changed the color scheme and it served well for towing all over the USA. Note the lettering on the front of the Carryall. Trouble indeed! Notice the front wheels have been changed to the more sturdy Halibrand 12 spokes. Here's a handout from the period after Don and Art split, when Don was back in the driver's seat. 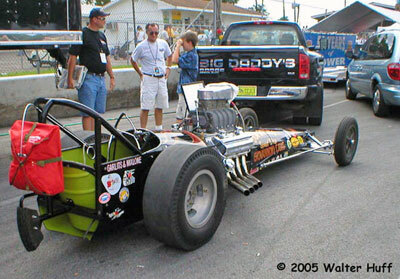 The Hilborn two-port injector has been replaced with an Enderle Barndoor, in this configuration Swamp Rat I-B turned 204.54 mph. One of the last runs for Swamp Rat 1B before retirement in early 1961. 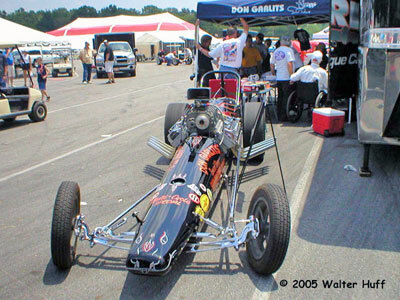 It was replaced by an all new car with a Connie Swingle built all chrome moly tubing chassis, which is known as Swamp Rat 3 and was recently recreated for Sonny Meisner. In the pits at Bowing Green. To date NHRR III is the only Cacklefest the car has appeared in. 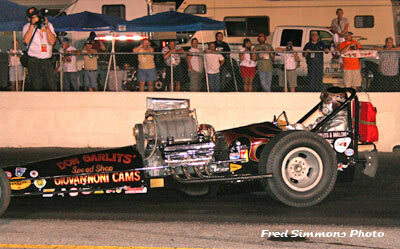 Here is Garlits in the introduction parade. "Big" fired going to his spot. And this would be CACKLEFEST! No matter where he goes, "Big Daddy" is in demand for autographs. Garlits and long time crewman, TC Lemon chat... or TC could just be telling Big another joke. 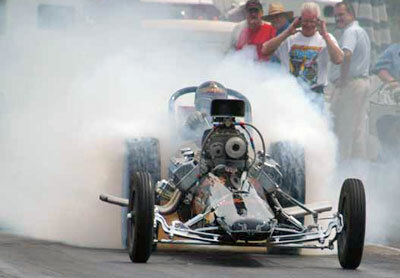 Unable to keep his foot out of a throttle, here's Don doing a smoky leave at Huntsville, Alabama in 2005.